Rachael Ray must be in a giving mood with the holidays approaching because I have run across several great giveaways lately! 1. 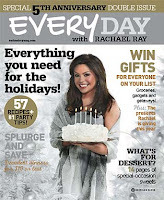 Holiday Gift Away 2010 - this is a huge giveaway running through the holidays, hosted by Rachael Ray's magazine. The grand prize is a trip to "Rachael Ray's World" that includes behind the scenes trips to her magazine and show. 2. Jimmy Dean Crumble Rumble - This one ends on 11/26 so go enter now! The winner of the contest will be treated to a trip to NYC to attend the taping of the Rachael Ray Show.